Even though there was only my brother and I in our family, I was raised in a large extended family. My mom had 12 siblings and most of them lived in the same area. I guess I always knew that my grandparents had 13 children. It was just part of my family story. And because I was raised in the middle of it, I didn’t give it much thought. It just was. My mom seemed to know everyone and everything about our family. I think it was because she was the youngest. Not only would she spend hours talking on the phone with her sisters, she also seemed to know whenever there was a wedding or baby coming. She has an incredible ability to keep it all straight. While some of my relatives just accepted people as family without much thought, I knew their names and who belonged to whom. I had learned from my mom–our family historian. I still remember the day I came home from church and asked my mom why I called one of the loving ladies in the nursery “Aunt Tina”. Even though I was young, I knew that there was something that didn’t make sense. Maybe it was because most of my aunts bore a striking resemblance to each other and this lady somehow didn’t fit. My mom was quick to explain that this “aunt” was actually the woman my mom’s sister Justine’s husband had married after Justine died. It didn’t really make any difference to me–blood or not, she was part of my family and that was it. I am sure I didn’t hear the story then, the reason my aunt died, but eventually her story would become part of the story of my family. The stories are part of being in a big family. They are part of my heritage. A lot of the stories are good. This was a family who loved each other and the God they served and I am proud to belong to them. I don’t know when it was that I realized that there were family tragedies waiting for me to discover. Those stories weren’t whispered secrets. They weren’t associated with any shame. Just sadness. Having so many aunts and uncles made it pretty easy for me not to miss one. By the time my brother and I arrived in the family the large family gatherings at my grandparents had all but finished. My cousins were getting married and having their own families and we just didn’t meet that often. And there were a few families that lived further away. I certainly couldn’t count them all even on my two hands so it isn’t surprising that I never missed one. But I would eventually hear the story. In 1937 my grandmother had to say good-bye to her 5th born, her 2nd son, Edwin, when he died from complications of appendicitis. He was 10 years old. 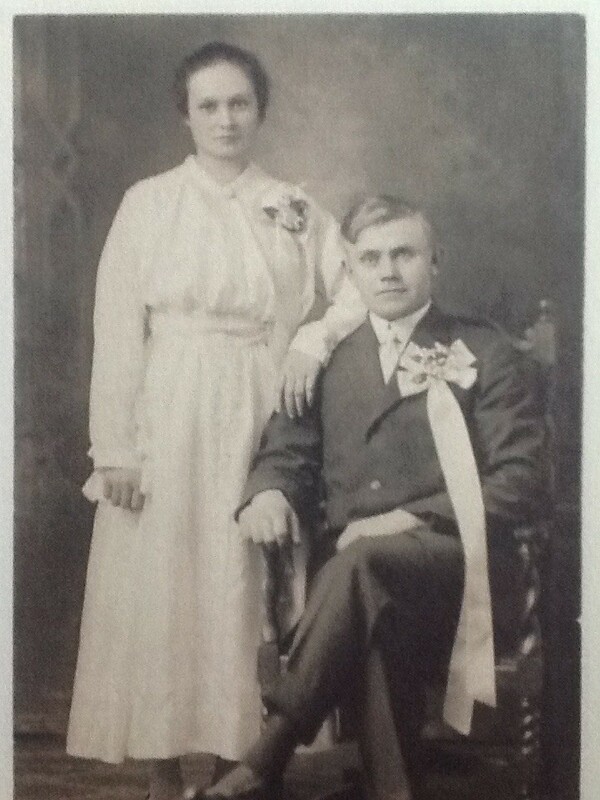 Less than 2 years later my grandparents moved most of their family from Saskatchewan to Southern Ontario in hopes of finding a better life for them. My grandparents didn’t return to their former home until 1949 when they made the trip west with my mother and her next oldest twin sisters. I’m not sure of the whole intent of the trip, my mom was only 5 at the time, but I do know one thing they did. They had made the pilgrimage to finally place a marker on their son’s grave, 12 years after he died. My twin aunts and my mom were born after Edwin’s death. They never got to meet each other. But he is still part of the “Baerg” family. He is part of my story. My mom’s sister Justine died from heart problems caused by a case of rheumatic fever she had as a child. She was 38 years old and a wife by that time. She also left 2 sons to remember her. They help to keep stories of their mom alive. By the time I was in my early twenties, my grandmother had buried 3 of her children. In addition to Edwin and Justine, my Aunt Helen died of cancer when she was in her 50s. I knew that my grandma sometimes had bad days. I just never thought about it. My grandmother died in 1993, 8 days after the birth of her 53rd great-grandchild, my firstborn daughter, Karissa. She was 2 months short of 95 years old. She left an incredible legacy. In the aftermath of losing Arlynne there have been many times that I have wished that my grandmother was still here. I have so many questions for her. Last month marked the 4th anniversary of my daughter’s death. She has officially been gone from my twins’ lives for more time than she was here for. I hadn’t really realized how much they have missed until we were buying Arlynne’s birthday cake on the day of her birthday. I asked Sarina what kind of cake we should buy and she said that she didn’t remember Arlynne so she didn’t know what kind of cake she would like. That was when it hit me. We have pictures of Arlynne around our house so Sarina and Nathan remember what she looks like but there is a lot they have forgotten. They have forgotten that bigger sister who was so excited to be the first one home to see them after they got home from the hospital. Nathan has forgotten the crazy “elephant ride” she gave him that ended up with a couple of staples in his head. He has forgotten the other bigger hand that he held when we all went to the pumpkin patch. WharThey don’t remember the constant parade of friends coming over for dinner or the VeggieTales marathons in the basement. They have forgotten her laugh, her smile and her cheery “HELL-o”. And their forgetting gives me another reason to mourn. I wish I could ask my grandmother how she could leave her little boy buried so far away in an unmarked grave in the pursuit of a better life. I don’t know if I could have done it. Even though I don’t visit the cemetery often I know that I can go whenever I want to. I want to ask her how she kept his memory alive to siblings who may not have even met him. A number of years ago my mom made a record of the family history that started with my great-grandparents and Edwin was right there. She had pictures of him and a family photo from his funeral (it is a Mennonite thing, I guess). She had also collected a couple of stories about Edwin and his puppy that only the family would want to hear. It had to have come from my grandmother. I would ask her how she did it–how she got up every day, knowing that 3 of her kids had proceeded her to Heaven. My grandmother was not perfect. I don’t think she did everything flawlessly. My aunts and mom would probably agree that she had her faults. But if anyone would understand my grief, it would be my grandmother because she has done what I have to do. She’s travelled the same path. I need other moms like my grandmother in my life. I need other women who are a little further down the same path but not so far that they have forgotten the journey. I want to be that woman to other moms who are behind me. Moms who have just had to say good-bye. I haven’t done it all perfectly either but I know how it feels, when life gets turned upside down and a child dies before her parent. By the time I see my grandmother again I doubt I will remember all the questions I wanted to ask her. Frankly, I won’t need to. She has already been re-united with Edwin and Justine and Helen. I hope she will have spent some time getting to know my Arlynne too. And my time of mourning will be over because I will be with the One who destroyed the power of death. Because of Jesus, I will be with Arlynne. And we’ll never be apart again.